CHOC Children’s offers MRI imaging services in a family-friendly environment combined with individualized care, specialty expertise and the most advanced technology. Our state-of-the art equipment provides unprecedented imaging quality that is geared towards children and their unique needs. MRI imaging gives incredibly detailed pictures of organs, bones and tissues without using ionizing radiation (X-rays). 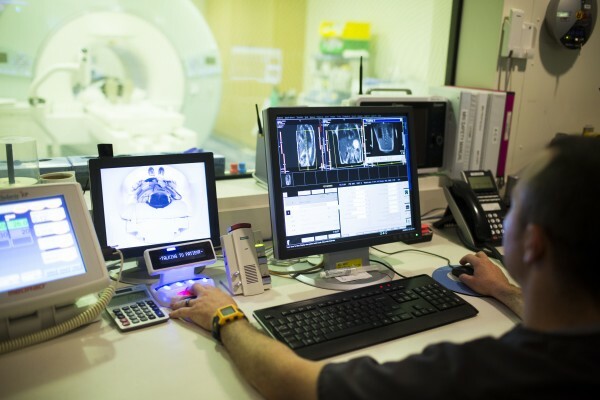 Magnetic resonance imaging or MRI is a non-invasive diagnostic procedure that lets a doctor see detailed pictures of the inside of a patient’s body. MRI does not use X-rays or any radiation. Instead, MRI machines use strong magnets and radio waves to form an image of organs, bones and tissues inside the body. Radiologists use expertise and specialized equipment to interpret the MRI to help diagnose problems or check how the body is responding to treatment. What types of MRI machines are used at CHOC Children’s? Siemens 1.5T MRI: At CHOC Children’s we are proud to offer our patients the very latest in MRI technology. We currently offer the latest Siemens 1.5T model MRI machine with advanced technology designed to reduce scan time by up to 50%. Siemens 3T MRI: We are also one of only a few imaging centers in the area that offer a 3T MRI. The 3T MRI provides many benefits to pediatric patients. The most notable benefit of the new 3T scanner is its increased speed and excellent image quality. The use of a super-short magnet also allows many exams to be completed with the child’s head outside of the scanner. However, a 3T machine isn’t always the best for every kind of imaging. The radiologist and the child’s doctor will select the right type of MRI machine depending upon the part of the body being imaged. When is an MRI needed? MRI is used to detect a variety of conditions. In some cases, it can provide clear images of body parts that can’t be seen as well with an X-ray, fluoroscopy, CT scan or ultrasound. An MRI’s ability to highlight contrasts in soft tissue makes it useful in deciphering problems with joints, cartilage, ligaments and tendons. MRI can also be used to identify infections and inflammatory conditions or to rule out problems such as tumors. Due to the use of the strong magnet, MRI cannot be performed on patients with implanted pacemakers, cochlear implants, certain prosthetic devices, implanted drug infusion pumps, neurostimulators, bone-growth stimulators, certain intrauterine contraceptive devices or any other type of iron-based metal implants. Guidelines from the radiology department will be discussed with the patient and family prior to the study. What is the preparation for a MRI? To help ensure the patient’s safety, please bring a list of the child’s current medications, allergies and information about any internal surgical implants to the MRI appointment. Children should wear comfortable, loose-fitting clothes without any metal, such as zippers, buckles or snaps. If anesthesia is not required, patients are encouraged to bring a favorite DVD to watch or CD to listen to. If anesthesia is ordered by your child’s physician, a radiology nurse will call you prior to the exam to discuss how to prepare for the exam. If the imaging will be done under anesthesia, a CHOC Children’s radiology nurse will call prior to the scheduled appointment with specific eating instructions for the day before the procedure and additional information about what to expect the day of the MRI. While a MRI is non-invasive and painless, we understand that these machines can be frightening to your child. Our associates—from our pediatric radiologists to our specially trained imaging technologists and nurses—work alongside our dedicated child life specialists to educate patients on their imaging tests and provide a variety of distraction techniques during their scans. We even have a toy-sized MRI machine that can help teach them about the test beforehand. Learn more about our child life specialists and distraction techniques. What to expect for the MRI? The MRI technologist will screen the child prior to entering the MRI suite. Because of the strong magnetic field, the patient must remove all jewelry and metal objects, such as hairpins or clips, hearing aids, eyeglasses and dental pieces. In order to get the highest quality images, the child must remain still during the scan. The MRI machine is a large, tube-shaped machine that creates a strong magnetic field around the patient. The patient will lie on a table that slides into a tunnel in the scanner. The technologist will position the child and make sure they are as comfortable as possible. During the scanning process, a loud clicking noise will sound as the magnetic field is created and pulses of radio waves are sent from the scanner. Some children may require an intravenous contrast material for the scan, there may be some discomfort with the placement of the IV into the vein but the contrast itself is not painful. The contrast medication will be given halfway through the procedure. A radiology nurse or technologist will call you one to two days before the procedure to explain this procedure. The technologist will be able to see the child through a front facing window as well as with a camera placed at the back end of the scanner, and will talk with the patient throughout the procedure. Most scans last 30-90 minutes. Will my child need contrast? Some children may require an intravenous contrast material for the scan, and this is ordered by your child’s doctor. If contrast is ordered, our radiology department will call to give you detailed instructions on how to prepare for your child’s test. The IV contrast is needed to check the blood supply of the area being studied. The IV contrast is considered very safe. The contrast medication is given halfway through the procedure, and the child may feel a sensation like they have to urinate or a warm flushed sensation just after the dye goes into the vein. This is a normal feeling and will subside quickly. There may be some discomfort with the placement of this into the vein. A report of your child’s scan will be sent to the doctor who ordered it, usually within 48 hours. (Please contact the doctor who ordered the scan for the results.) Patients should be able to resume normal activities immediately, unless your child’s doctor instructs otherwise. If anesthesia was administered, the child will be taken to the recovery area to be watched until the medication wears off and your child wakes up. Your child may feel groggy, tired or sleepy for a period of several hours after the procedure. If contrast was used, mildly increase your child’s fluid intake. The contrast will pass naturally through your child’s body within a day.